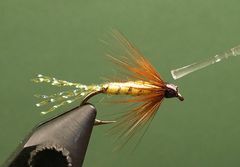 This Brown Hackle Yellow is one of three color variations of an old time trout wet fly that's a great panfish producer. 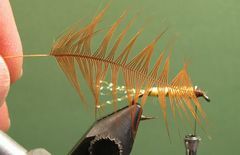 The other color variations are the Brown Hackle Orange and the Brown Hackle Red. 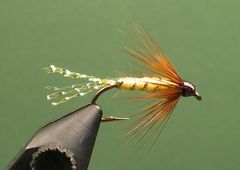 This is a basic wet fly pattern with a tail, rib, body, and hackle collar. It can be tied in a variety of colors or a combination of colors that are attractive to panfish. 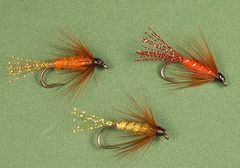 In addition to the Brown Hackle Yellow, I tie two variations, one with a red body and tail and one with an orange body and tail. All three color variations work. The body is made from Uni-Yarn. This material should be in every fly tyer's materials cabinet because it's so versitile. It comes on a spool in a variety of colors. Because it's fuzzy, many tyers use it in place of dubbing, even on very small flies. 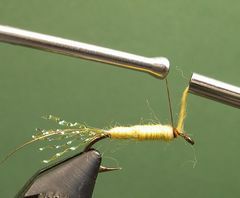 You will need a pair of pliers to flatten the lead underbody if you want your fly to look like the one in the tying sequence. But, the fly looks just fine with out the flattened body. It's just a slightly plumper fly. 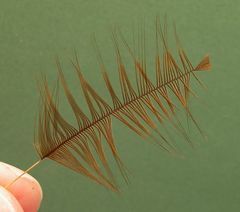 A hen neck feather works best for the hackle collar because hen is softer and webbier than rooster feathers. I fish both weighted and unweighted versions of the Brown Hackle Yellow. The unweighted version is more boyant. Consequently, it sinks much slower. When the unweighted version is fished, strikes often occur as the fly sinks slowly. Fish it like you would any other wet fly. 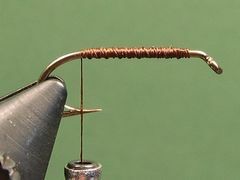 Cast it into fishy looking cover or along weed lines and fish it with a strip-strip-pause retrieve. If that tactic doesn't work try consistent short strips. Start the thread a hook's eye width or so behind the hook's eye and lay down a base of thread back to the hook's bend. 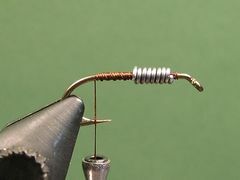 Wrap about eight turns of lead wire to the hook's shank. Leave plenty room ahead of the lead wraps for the hackle collar and thread head. Tie in about eight or ten strands of Crystal Flash for the tail. The tail's length should be about two-thirds the length of the hook. Tie in a piece of Oval Tinsel, at the base of the tail, for the rib. Put the Uni-Yarn on a materials bobbin and tie in the tip of the yarn at the base of the tail. Move the thread to the front of the hook. Wrap the Uni-Yarn forward to form the body and tie it in with the standing thread. Remove the Yarn. 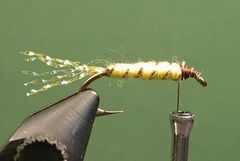 Wrap the Olval Tinsel to the front of the body, in fairly wide spirals, and tie it off. Select an appropriately sized hen neck feather for the collar and prepare it to attach to the hook's shank. 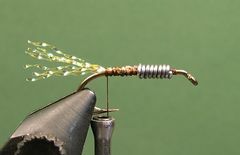 Tie it in by it's tip directly in front of the body with the cupped side of the feather facing the hook's shank. Make four or five turns of the feather and tie it off with the thread. Remove the excess feather. 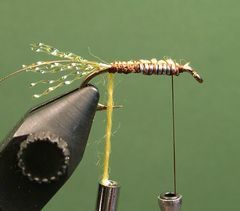 Take some wraps of thread back against the collar to make it slope toward the rear of the fly. During this process begin to form a neat thread head. After you have formed a neat thread head, tie off the thread with a couple of half-hitches or a whip finish, and coat the head with head cement. I use Sally Hansen's "Hard As Nails" nail polish because it's a great head cement and it can be applied with the nail polish brush. 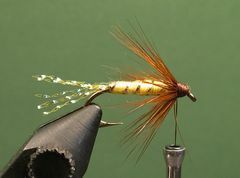 Let the head cement dry and your Brown Hackle Yellow is ready to be fished.